Phoenix Air has released a statement explaining why the now infamous non-HazMat-wearing 'clipboard man' seen in close proximity to Dallas Ebola patient Amber Vinson (while the rest of the members of staff are fully protected) was unprotected... and it will blow your mind. 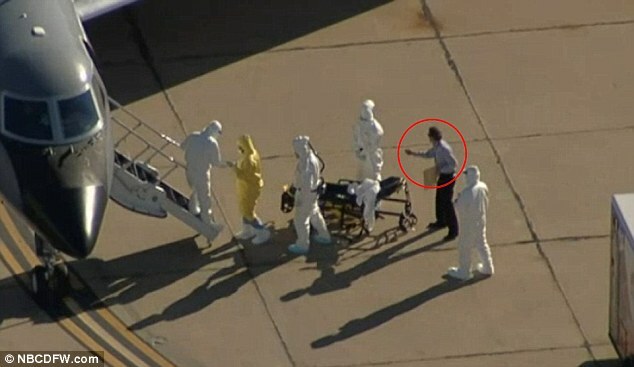 Why is "Clipboard Man" not wearing protective gear? "Our medical professionals in the biohazard suits have limited vision and mobility and it is the protocol supervisor’s job to watch each person carefully and give them verbal directions to insure no close contact protocols are violated," a spokesperson from Phoenix Air told ABC News said. "There is absolutely no problem with this and in fact insures an even higher level of safety for all involved," the spokesperson said. So - in summary - due to the restrictive vision when wearing an Ebola-protective suit, one member of staff must be sacrificed/exposed to ensure no one trips?